The case of Henry Rivett Albrow, a conscientious objector. It is the case of Henry Rivett Albrow that forms much of the plot of Devils on Horseback. When he is called before the tribunal he is erudite and eloquent in his impassioned defence of his conscience, calling himself a ‘dissident Christian’ – mainly because he cannot reconcile ‘love thy neighbour’ and ‘thou shalt not kill’ with the church’s acceptance of warfare. He is berated mercilessly by the members of the tribunal, with the usual nonsensical questions that are asked of pacifists; ‘what if a German raped your mother?’ Calmly and clearly Albrow states that he would not take a life to save one, but he would gladly give his own to save another – rendering moot the argument that pacifism is based in cowardice. A film that uses humour to convey the absurdity of armed conflict. Sands Films is a unique gem; snuggled up against the south bank of the Thames, it is one of those little secrets that Londoners cherish. 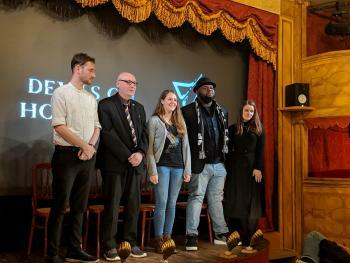 Not usually known for their events – it’s normally a fully functional film studio – they felt they couldn’t let the centenary of the First World War Armistice pass unmarked. I’m very glad they didn’t, and judging by the packed house, I’m not alone. Schwejk (pronounced Sh-wei-ck) is Sands’ own project, shot with the WW1 Centenary in mind. They screen it in the same room in which it was filmed, adding an interesting, atmospheric twist. Based on the famous series of stories by the Czech writer Jaroslav Hašek, Schwejk is a satire on the absurdity of war. Many people have identified with the character of Schwejk since his first appearance in cabaret in 1912; he is just an ordinary young man, sold lies and sent to fight someone else’s war. As a play it has been performed all over the world, from Germany in the inter-war period, to Manchester and beyond, often being brought up to date to reflect contemporary events. Sands’ version is no different, containing references to Iraq, Afghanistan and the so-called ‘War on Terror’. Leon Fleming's new play concerns a brother and sister growing-up and living in Birmingham trapped in the clutches of an uncaring welfare system. The story is told with flasback scences from their childhood, mixed with the contemporary tale of two people being processed by The System TM and trying to survive. It is a grim tale, but not without moments of comedy, but those bittersweet moments come from the past rather than the relentlessly grim present of our protagonists. Their lives now trapped within the uncaring bureaucracy. The play was staged at The Hope Teatre, a 50 seat studio theatre above the Hope and Anchor pub, and it was heartening to see a full house. These smaller venues are the breeding grounds of talent. This play was a brave choice. I don't want to be too critical because these stories need to be told. I really wanted to like it; the performances of the two actors, Helen Budge as "Her" and James Clay as "Him", and the production overall are excellent, but it left a sour note. If you are actually living in the hellhole of the dull grind of poverty, then turning the misery into a dramatic work that will sell t‪ickets for a nights entertainment is a bittersweet experience. A play written and performed by Tayo Aluko. Piano accompaniment by Michael Conliffe. Directed by Olusola Oyelele. Designed by Phil Newman. 4th-20th May 2012. Warehouse Theatre, Dingwall Road, Croydon CR0 2NF. £12/£11. Box office 020 8680 4060. Further performances: 26, 27 August, Greenbelt Festival, Cheltenham Racecourse. If you get off a train at East Croydon, you may well gaze around and wonder which of the towering office blocks is the infamous Lunar House that ‘processes’ foreigners and refugees; the building that decides who is welcome in this land and who is not. Look around and you will find, overshadowed by the rise of concrete, The Warehouse Theatre. “Oh look” you’ll say, “a proper theatre”. It is intimate, adventurous, has no Corporate Identity. It is a place of Art in the making. Showing here until Sunday 20th May is ‘Call Paul Robeson’, a profoundly moving one-man play written and performed by Tayo Aluko. An elderly Robeson looks back at the trajectory of his life through a super-star singing career, academic and intellectual achievements and his love of women, humanity and justice. His political commitment was first stirred by talking to Welsh miners in London and led him to his understanding that the struggles of 1930s British workers were just as much a product of capitalism as the African-American slavery his own father was born into. It was his statement, “The Artist must take sides, he must elect to fight for freedom or slavery. I have made my choice. I had no alternative” made in support of the Spanish Republicans that defined his intellectual and creative life. For this commitment he was ‘called’ by the Committee on Un-American Activities; was harassed and persecuted by the US government; not welcome in his own country but forbidden to leave. Review of 'Three Weeks in Wales', a tour in solidarity with the Bradley Manning who lived and went to school in Wales. WISE Up for Bradley Manning is a loose network of groups and individuals in Wales, Ireland, Scotland and England (WISE) taking action for Bradley Manning, the young US military intel. analyst with Welsh roots who has been held for almost two years without trial accused of blowing the whistle on war crimes and revealing other truths the US would have preferred to keep buried. Bradley Manning has been tortured and denied his constitutional rights. President Obama, Commander-in-Chief of the military, has already said he broke the law and has therefore irrevocably prejudiced the upcoming court martial as well as breaking – not for the first time – his election promise to protect whistleblowers. We call for all charges against Bradley Manning to be dropped and for his immediate release. Blowing the whistle on war crimes is not a crime! When we heard that Tim Price’s new play The Radicalisation of Bradley Manning was to be performed by National Theatre Wales in Pembrokeshire, Cardiff and Flintshire during April, starting with Tasker Milward, the school Bradley attended as a teenager in Haverfordwest, it seemed an ideal opportunity to organise a series of solidarity actions and events to coincide with these performances. Our aim was to raise awareness of, share information about and generate support for Bradley across Wales. 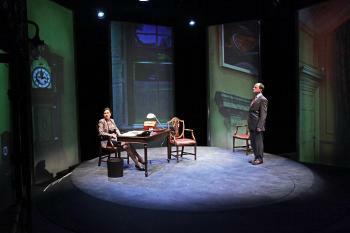 Patrick Nicholson reviews the new play at the Tricycle on nuclear weapons. The Tricycle Theatre, “Britain’s leading political playhouse” according to the Times, is running a season of events examining nuclear weapons and the nuclear debate. A centrepiece of this season is an ambitious two-part, five hour sequence of ten new short plays exploring nuclear issues, the performances punctuated and complemented by verbatim readings, archive footage and images. Background info on PN's Clown Training Workshop in March 2012. Peace News is hosting a clown army training weekend 3-4 March in London. It will culminate in waddling off to do an action. Welsh hero of the nation, Capten Cyboli will be present. To cover venue hire and train fare for recruiting sergeants a suggested contribution is £15-£40 depending on pocket. If anyone knows a free venue the cost will be enormously less. The Clandestine Insurgent Rebel Clown Army (CIRCA) has reclaimed the art of Rebel Clowning: its combatants don’t pretend to be clowns, they are clowns, real trained clowns. Clowns that have run away from the anaemic safety of the circus and escaped the banality of kids parties. CIRCA aims to make clowning dangerous again, to bring it back to the street, restore its disobedience and give it back the social function it once had: its ability to disrupt, critique and heal society. Rebel Clowns are trained by CIRCA recruiting officers, using a variety of different exercises, training includes finding your inner clown, civil disobedience tactics, learning to be spontaneous and playful, practising clown gaggle manoeuvres and, last but not least, marching and drilling. Back in July, Le Monde Diplomatique carried a fascinating article by Guillaume Pitron. It was, of all things, about gum arabic, the resin of the acacia tree. Gum arabic is mentioned in the Qu’ran and the Bible. These days, labelled as E414, it’s an essential additive in many sweets, medicines, cosmetics, textiles, foods and drinks. It’s an especially important ingredient in Coca-Cola. Without this resin, the black colouring in Coke would rise to the surface. So every can and bottle of Coke contains tiny quantities of a substance which was used in the mummification of the pharaohs. Gum arabic comes from the “gum belt”, a swathe of acacia trees running across Africa from Senegal to Somalia. The best resin, and half of the world’s supply, comes from one country alone: Sudan. In fact, Sudan’s acacia resin is so important to the West that trade in it was quietly allowed to continue despite the trade embargo imposed on the country in 1997. Nothing, it seems, can be allowed to interrupt the vital supplies of E414 – not even human rights abuses in Darfur. Dale Farm in Essex is the UK’s largest Travellers’ community. The residents have been fighting for ten years to remain there but now 90 families of 500 people, many of them children, face eviction from 31 August. The Conservative-led Basildon Council has set aside £18 million for an eviction which could take weeks, while supporters have set up a solidarity camp at the site. The community at Dale Farm are predominantly Irish Travellers and many have lived there for 30 years. They own the site but planning permission has refused because the land, a former scrap-yard, is designated “green belt”. Residents point out that the council has over-ridden green belt status elsewhere for development. They consider that the eviction is disguised ethnic cleansing, pandering to hostile neighbours. The Travellers have been refused alternative culturally appropriate sites, and Amnesty International argue that “Basildon Council has not engaged in genuine consultation consistent with international human rights standards”. I was very intrigued when I first heard about the Piccadilly Community Centre. To someone who works in community centres, knows what value they provide to individuals and communities, often fights to keep them open and despairs at how many are now closing, the opening of a new community centre in central London was very exciting. When visiting it on opening day it was obvious that money had been spent on the project. For example the signage outside the building was brand new and gleaming, there were about six new computers for use, there were free teas, coffees and biscuits provided, there was specialist equipment throughout the building together making for a good facility. As I made my way around I asked who is paying for this. I was hoping the answers would provide a strategy for keeping other community centres open. But I couldn’t find any written information about the background to the project, who was running it or how it was funded. Everyone I spoke to was evasive. I left puzzled.